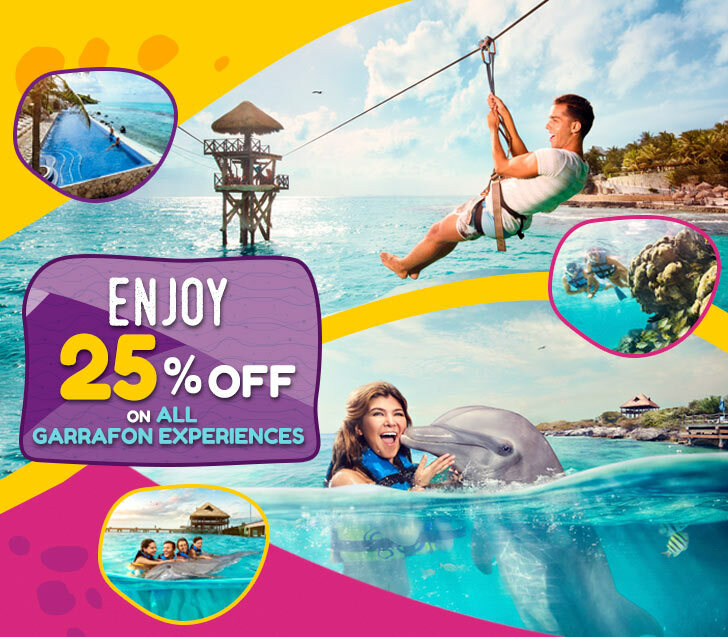 Get all the perks included in our Royal Garrafon package and the chance to bond with a friendly dolphin. If you are traveling with small children or others who prefer to remain in shallow water, then this package is perfect for you. The Dolphin Encounter takes place in our dolphin habitat, but doesn’t require swimming. You will learn about dolphins while having lots of fun interacting with them in our gorgeous surroundings. In addition, you will get to know the beautiful reef park of Garrafon, where you can practice snorkeling and have fun in the zip-line with panoramic view above the Caribean sea of Isla Mujeres. 15 min Briefing and 40 min in the water for Dolphin Encounter program. Round trip Cancun - Isla Mujeres - Cancun, departing from Playa Tortugas. Dolphin behaviors such as the Handshake, Hugs and Kisses. Snorkel equipment, life jackets, kayaks, hammocks, pool, showers and lockers. Dock fee ($10.00 USD payable at check-in). Kids must be at least 1 year old to participate in the Dolphin Encounter ® program. Kids shorter than 2 9" are free of charge and must swim with a paying adult as a companion. Please write on the comments section a free entrance request for your kids or send us your request by email once your reservation has been made to customercare@dolphindiscovery.com. In Dolphin Discovery Isla Mujeres, groups have a maximum of 20 people for a closer experience. The use of a safety vest is required for all Garrafon water programs. We have 2 free ferry services at 9:00 am and 11:00 am in different departure points according to your booked program.